Oh. My. This is so good! 5-6 green onions, chopped, opt. Cook pasta al dente in liberally salted water per package instructions. Drain pasta then rinse in cold water. Drain again, then place pasta in a large mixing bowl. Don’t let it sit and dry out too much; the pasta should be on the moist side. While pasta is “marinating,” slice bacon into 1/2-inch ribbons, and cook until crispy; drain, and set aside. Remove softer, outer leaves from lettuce. Roughly chop approximately 4 cups from the inner (more crunchy) leaves; set aside. Whip together mayonnaise, ranch dressing, and vinegar, then add mixture to the cooked pasta, and stir to combine. Add half the bacon, tomato halves, chopped romaine, and green onions to pasta, and gently stir until all ingredients are thoroughly combined. Top with remaining half of bacon, and serve immediately. If not serving this immediately, mix all but the romaine and second half of bacon. 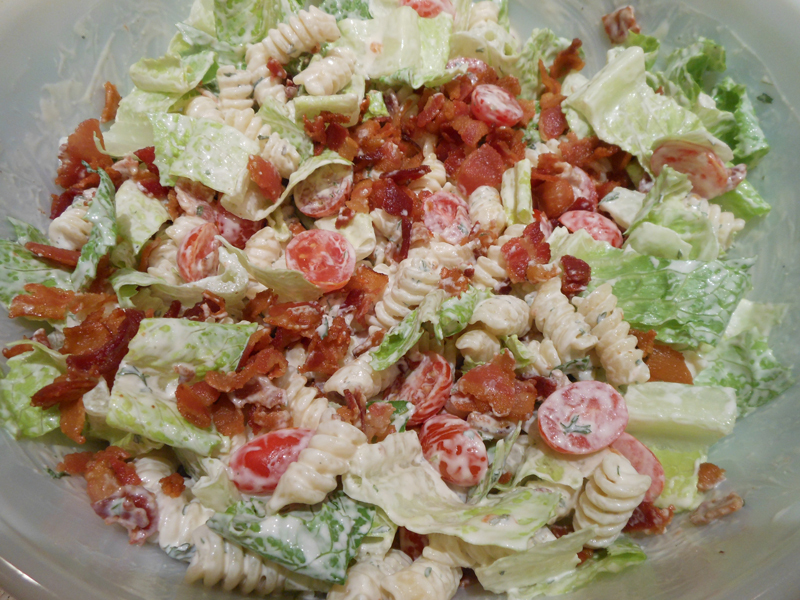 When you’re ready to serve, toss pasta with romaine, then top with remaining half of the bacon.